Shaun of the Dead, Edgar Wright's satirical zombie comedy that is the first film in his famous Three Flavours Cornetto Trilogy. Shaun of the Dead follows Shaun, his friend Ed, and Shaun's girlfriend, Liz, after a zombie outbreak spreads across London. Unlike most zombie movies, director, Edgar Wright, takes a witty and satirical approach by adding a lot of very smart humor into a surprisingly strong zombie narrative. Compared to most comedies, Shaun of the Dead actually has a surprisingly well developed cast of characters, and some elements of the plot are taken seriously at times, but it never forgets the humor. Also, while I am not the biggest zombie fan, after watching becoming a fan of The Walking Dead, my interest in genre has grown quite a lot. Plot: 8.1/10- For a comedy, Shaun of the Dead's plot is astonishingly smart. 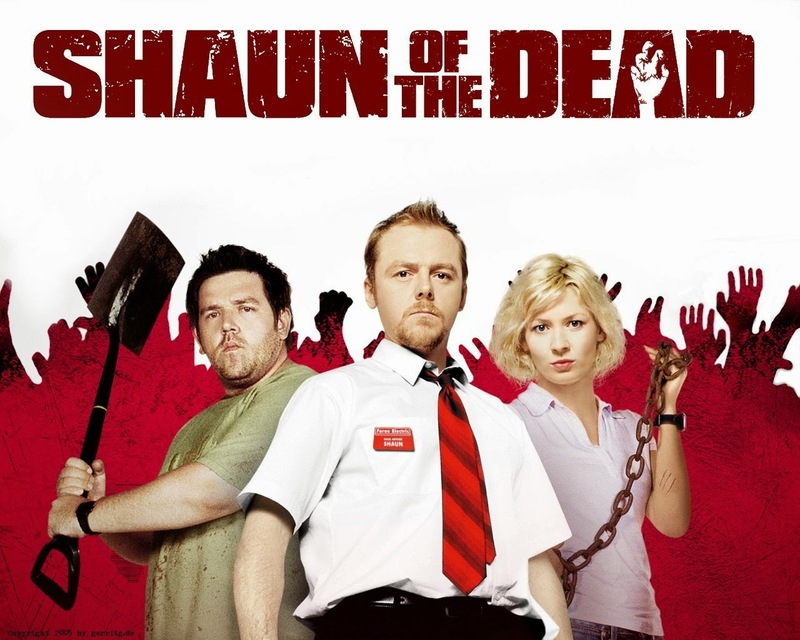 The movie starts out by showing the day to day life of Shaun before the outbreak, which works well to establish the characters, yet those scenes are often humorous. The zombie outbreak aspect of the movie is rather standard fare in terms of story; however, being similar to other zombie movies is part of the satirical elements, so it works. Towards the end of the movie, it goes for a more serious tone, and while it is a tad jarring at first, it works, and the ending is positively perfect. The only issue with the more serious tone is that if you are expecting there to be genuine horror movie thrills, you will be disappointed. One thing to note is that the movie's pacing in the beginning may be a tad slow for some viewers. Characterization: 8.7/10- Considering that most comedies have flat characters that are only present to create laughs, Shaun of the Dead's characters are surprisingly likable and the main ones even have character arcs. Shaun is the most developed character, and he is a character that is easy to like. Action: 7.5/10- As one would expect with a zombie flick, there is some zombie killing action. A lot of the action is played for laughs, which is for the best. Acting: 8.9/10- Simon Pegg delivers the dialogue with the perfect amount of dry wit, and he even makes the few dramatic scenes work. Nick Frost has excellent chemistry with Pegg, making them one of the best comedic duos in years. Bill Nighy plays Phillip and even though it is a small role, he is positively hilarious. Kate Ashfield as Liz plays her role well, and Martin Freeman makes a very brief appearance. Special effects: 7.9/10- Considering the $6 million dollar budget, the zombie effects look fine for what they need to be. Soundtrack: 7.6/10- Pete Woodhead and Daniel Mudford's score does its well job, although it is not particularly memorable. What is memorable is the hilarious use of Queen's "Don't Stop Me Now" song. Humor: 9.4/10- Edgar Wright's brand of humor is British, and therefore, it is dry and witty rather than crude. Since humor is entirely subjective, if you do not like British humor, you will likely not enjoy Shaun of the Dead's comedy. On the other hand, if you are like me, then you should find the movie humorous. Also, there is quite a bit of dark humor with the zombies. To me, crude humor is not funny most of the time, and by crude humor I am referring to sexual humor. Fortunately, Shaun of the Dead's humor is mostly very smart and satirical, which is one of my favorite types of humor. The dialogue is well written, and Edgar Wright's quirky directorial style is bold and unlike anything else; I love it! Entertainment Value: 9.1/10- Even though the first 15 minutes did not instantly attain my attention, after that, Shaun of the Dead entertained until the end. Overall: 8.6/10- Overall, Shaun of the Dead is a smart comedy with surprisingly well realized characters and a unique directorial style by Edgar Wright, which results in my favorite zombie flick to date. Closing comments: Shaun of the Dead's unique style and humor is both its strongest weakest aspect depending on your personal preference of humor. If you are a zombie fan however, you should most definitely give Shaun of the Dead a viewing. One last thing, a big thanks go to my best friend Jamie for recommending the movie and convincing me to watch it. Star Wars Ep. 7 Delayed?